Among the projects being developed by Joe Fallon is Twenty Two Liberty, a luxury residential building, in background. Not one of the many buildings Joe Fallon has developed bears his name. He prefers to avoid the media spotlight. He pays his bills, keeps his commitments, and stays out of court. 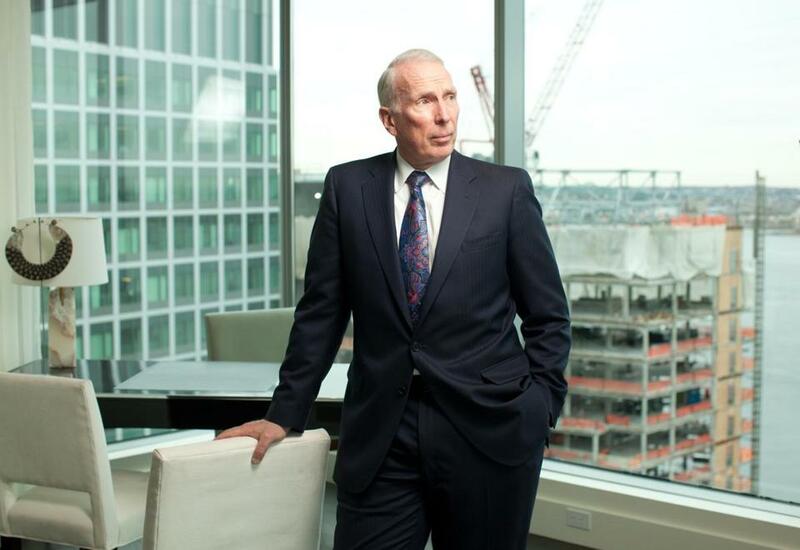 Fallon, the founder and chief executive of the Fallon Co., has made a career and virtue of keeping a low profile, building his company into one of Boston’s biggest developers through the simple strategy of getting things done. 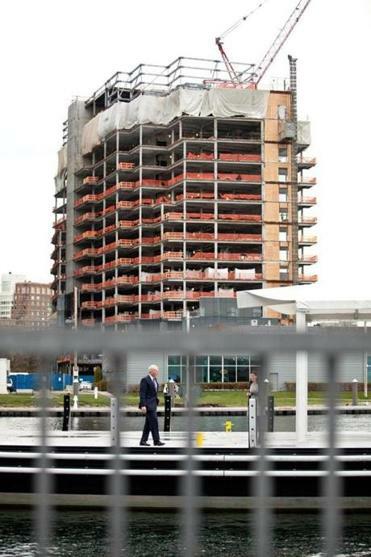 Over the course of his firm’s 21-year history, Fallon has overseen the construction of billions of dollars in buildings and done more to reshape the South Boston waterfront than perhaps any other developer. He was among the first to see the potential of the old industrial district of factories, warehouses, and parking lots, building the first hotel in area and later taking on and pushing forward the stalled Fan Pier development — even through the worst national recession in 70 years. Today, three of seven towers are complete, standing over 200 feet tall, and three others are under construction. The total cost of Fan Pier, when completed over the next decade, will be almost $4 billion. Those who know Fallon said he works hard, hires good people, and knows his business, whether at home poring over financial details or inspecting a construction site. He adheres to old-school principles, like sealing deals with handshakes and letting his actions speak louder than his words. Mayor Martin J. Walsh recalled negotiating a broad labor agreement with Fallon for construction work on Fan Pier several years ago when he led the Boston council of building trade unions. It was the only time, Walsh said, he negotiated such an agreement with a developer without a lawyer in the room. After Walsh became mayor this year he asked Fallon to contribute to help pay the expenses of the Dorchester Eagles, a Pop Warner football team traveling to Florida for the national championship. Fallon pitched in $10,000 to cover the hotel bill for more than 30 players and their chaperones, Walsh said. In a rare interview, Fallon, 62, credited his success to following two basic rules: Keep your commitments, because you’re nothing without credibility; and, if it doesn’t make money, don’t agree to it. He could get along just fine, he added, without any attention from the media. Joe Fallon on the marine deck at Twenty Two Liberty, a luxury residential building currently under construction at Fan Pier. Fallon grew up as one of five children in Milton. He worked for his father’s general contracting business in high school and studied architecture and civil engineering at the Wentworth Institute of Technology. After graduating, he took a job with the South Shore developer Thomas J. Flatley, working with neighbors and other residents in various communities to smooth the way for Flatley’s projects. Flatley, who died in 2008, built a $1.3 billion suburban real estate empire across much of New England. Fallon, who still calls him “Mr. Flatley,” said many of Flatley’s values, such as the importance of credibility, were ingrained into him. There was one important difference, though. Boston didn’t appeal to Flatley because he didn’t like dealing with the many groups that doing business in the city entailed, Fallon said. But Fallon enjoyed meeting, talking to, listening to, and working with neighbors, local pols, and other interested parties. Recently, when his company proposed a redevelopment plan for Somerville’s Union Square, Fallon appeared before a citizen’s panel rather than send a lawyer or an executive. Fallon started his company in 1993. At first, the projects were small: 30,000 feet of commercial space here, 50,000 there. But during the Big Dig, the city’s massive transportation project, Fallon said, he realized the waterfront’s access to highways and public transit would make it an ideal place to build a neighborhood. His first project was the Park Lane Seaport apartment towers, approved in 2002, at the eastern end of the waterfront. Later, he helped revive the stalled Westin hotel project near the Boston Convention and Exhibition Center. Roger Berkowitz, president of Legal Sea Food restaurants, said Fallon’s vision of a bustling neighborhood was contagious. He helped Berkowitz see the potential of the Seaport, even when it was still desolate. Berkowitz opened the first Legal Test Kitchen in one of Fallon’s buildings in 2005. It has taken more than enthusiasm to develop Fan Pier. The project was on the drawing board for about two decades when the late Mayor Thomas M. Menino pressured the property owners, the Chicago-based Pritzker family, to sell. In 2003, the Pritzkers put Fan Pier on the block, only to have two prospective buyers back out. Spotting an opening, Fallon and two financial backers paid $115 million in 2005 for the 21-acre expanse of parking lots. Fallon broke ground in 2007; that December, the recession hit — and only got worse. The risks for Fallon were huge. Instead of financing the construction wholly through debt, Fallon put his company’s equity on the line. He also had made promises to retailers and restaurateurs in his buildings that people would flock to their businesses. Calling it quits would have meant losing more than money; his credibility was at stake. As the economy recovered, the space started to fill. Fish and Richardson, a law firm, moved into 124,000 square feet. Vertex Pharmaceuticals paid $1.1 billion for a 15-year lease of two buildings. Fallon responded that people should withhold judgment until Fan Pier is completed, confident his buildings are right for Boston. Fallon and his wife, Susan, will call Fan Pier home when they move from Belmont into a condo to be finished in 2015. But Fallon, who works 12-hour days, has no plans to retire. He is looking to build in New York, Miami, and Washington. Already, he said, he’s spending about a quarter of his time — and soon a quarter of his money — on developments beyond Boston. Fallon said the cities are different from Boston, but they share a sense of vitality and growth, as well as a noisy process involving planners, neighbors, advocacy groups, politicians, and various boards and commissions. And he’s ready to work through it, carefully, deliberately — and quietly.